teacher’s review of student projects, and provides a reusable and low-energy solution for storing and distributing classroom material. For example, a choir teacher can distribute songs to his students by inserting the USB into an MP3 player and copying all the songs in minutes. 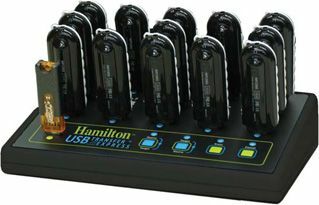 The teacher can copy all the files to up to 15 USB drives. At the end of a grading period, the teacher can collect all the assignments from a class to one USB drive, also in minutes. PROS: The product is simple plug-and-play. Just insert the source drive in the slot marked “source,” insert the target drives in one or more of the target slots, and press a button. CONS: It’s debatable whether the EduCast USB Duplicator’s cost is justified by the use it would get in a school. Educators would also have to be mindful of copyright infringement. OVERALL IMPRESSION: This is a really good idea, especially since more teachers have sample files they want to distribute to students. For example, in our school we have to download large-print books for visually impaired students, and this type of device would be fantastic for getting these files to them.